One of the first places I visited when I decided to do this little thing called derryX Dines was Illium Cafe. My overall impression was that it was a good little sandwich shop. 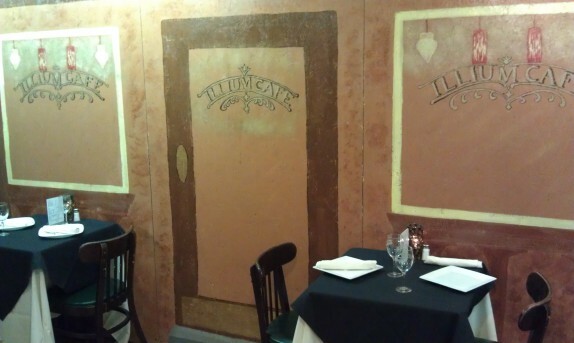 Over the past 16 months, I’ve seen Illium Cafe evolve. It has become a regular brunch spot for us on Saturday mornings, as we can always count on something interesting and delicious to be on the specials menu. In fact, it has gotten to the point where we will keep checking their facebook page on Saturdays to decide whether we’ll make the drive to Troy to eat there and roam the Troy Farmers Market. The regular breakfast menu is great, but the specials excel. Last week, I had a quesadilla with elk meat and sweet chile salsa that I’m still thinking about. Illium Cafe has now evolved even further. Illium has expanded into the space next door and has added a wine bar and dinner menu, available Thursday, Friday, and Saturday nights. I was excited when I saw the menu. I had the pleasure of attending the opening night festivities from 5-6pm on January 20, and ate dinner at the beginning of dinner service. We arrived at around 5:25pm, and the place was already packed! I was surprised to be greeted at the door by T.R. Laz, wedding professional whom I know from a previous life, who was there taking pictures. Chef Marla Ortega greeted us with hugs and seemed to be taking in the whole thing very well; when she saw us with no champagne, she made sure to double check that we didn’t want any. I recognized a few of the other guests. I saw Todd (I believe) from Adventure in Food Trading, Yono was there, some other food and wine critics that seemed really familiar, and Cassie told me she saw Steve Barnes there while we were eating dinner. At around 6pm, they started seating for dinner service. I had a reservation set, because the chef had urged me to make one. I was glad that I did! Our waitress was a young lady that we were familiar with from breakfast service. She was very accommodating and amicable throughout the service. 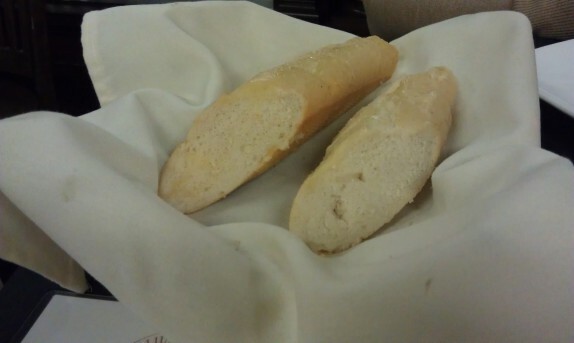 She brought us bread to the table, and took our wine order. 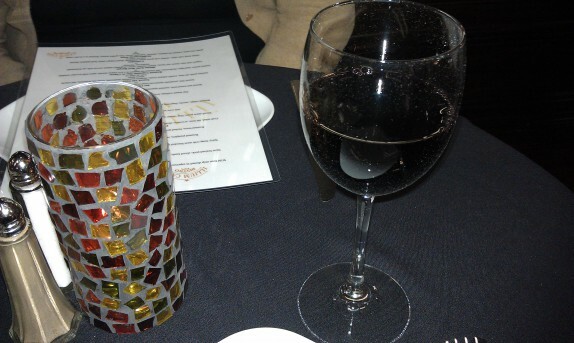 I ordered the Montepulciano wine. 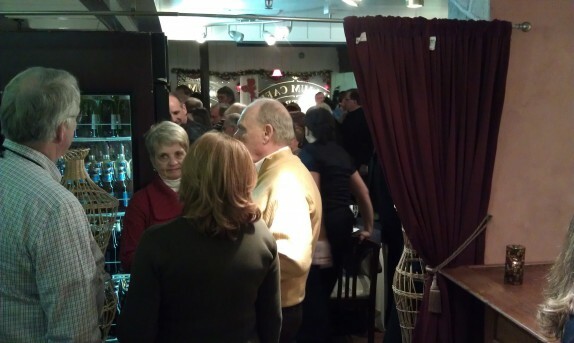 The varietal available that evening was Gran Sasso Abruzzo ($10/glass). 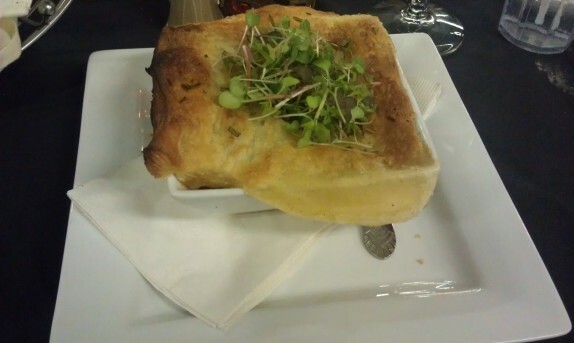 As an appetizer or teaser, as the menu calls it, I ordered the rabbit pot pie (Braised rabbit, carrots, fingerling potatoes, celery, fennel, in a brown liaison with a rosemary pastry crust. – $9). I was amazed by the size of this dish. Under the pastry crust was an insane amount of rabbit stew. I made sure to carefully move the pastry aside to get a glimpse of what was underneath. All of the vegetables were discernible and cooked to a perfect aldente. It was a little underseasoned (salt) and lacked any flavor from fennel, but was overall hearty and delicious. The challenge of distributing the pastry throughout is a lot of the fun of eating this. 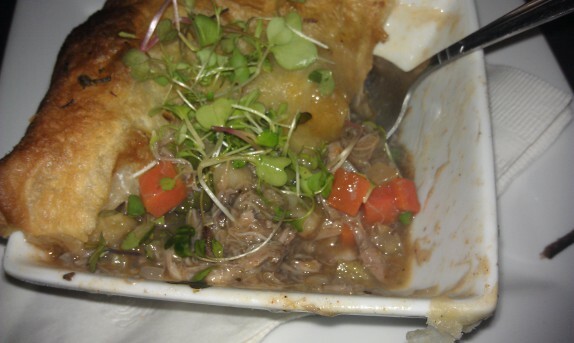 The playfulness of the microgreens on top, nudging that there’s rabbit under the pastry is a great signature punctuation mark for the dish. There was a lot going on with this dish. I wasn’t particularly a fan of the Brussel sprouts, so I picked those away. The spaetzele tasted delicious. 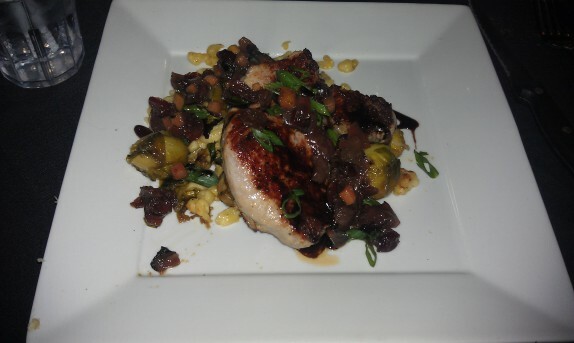 They had a nice texture and were a great flavorful base for the dish. The roasted fennel was also very nice; it really helped elevate the flavor. My pork was cooked perfectly, crusty on the outside and moist in the center. The salt level was much higher in this dish; it was pretty aggressively seasoned, and I couldn’t tell if it was from the brining process or from additional seasoning or both. I was adequately satisfied with the dish. Cassie ordered the the seared ahi tuna (Sashimi grade ahi tuna, wasabi infused risotto, tempura portabella mushroom, sweet soy reduction, and sriracha beurre blanc – $19/full portion). She indicated that it was very good, but couldn’t find the tempura portabella mushroom; she did get Brussel sprouts as well. The place was very busy. About 90 minutes after dinner service started, we heard the wait staff unfortunately ask diners to choose different starters because they ran out of scallops. The people in the kitchen were working their asses off; the staff in the dining room were working their asses off. Despite a few hiccups, things seemed to be a success for Chef Ortega and Illium Cafe that evening. The night was far from over for them when we finished eating.